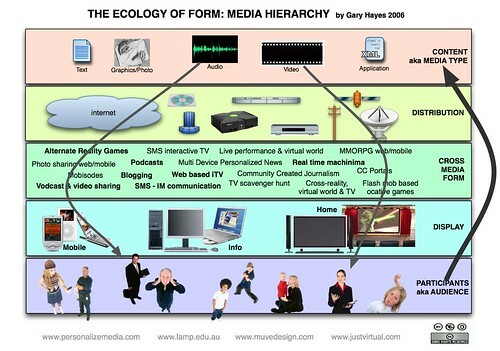 Over the years I have been creating lots of confusing, busy yet at the same time, meaningful and insightful emergent media diagrams. These attempt to help the uninitiated heritage media folk, get to grips with a multiplatform, shifting-social-media-sands, transmogodified entertainment landscape…breathe. So I have been uploading a bunch of these diagrams onto my flickr account over the past weeks, partly to make them more accessible to me too (oh the joys of the cloud) but with the creative commons tag, for all and sundry to use (attributed of course – the only way to power & fame nowadays – cackles!). Here is a short selection of the 25 or so already up, with brief descriptions – the main bunch is in a set called ‘Emergent Media’ here. 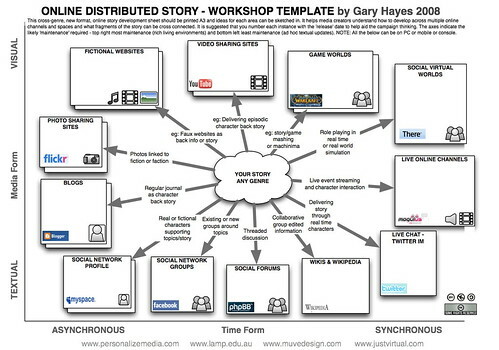 The above diagram is intended to help storytellers simply understand a range of key places to distribute their story fragments or triggers online. 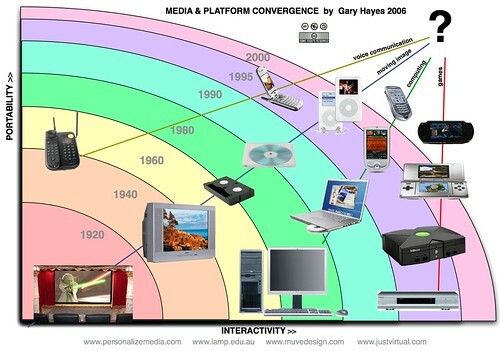 I always aim to have x and y axes and here I decided to differentiate these ‘social media services’ by time vs richness. So x axis is ad hoc dip-in-out through to realtime/live and y axis is basic text through to video/games etc: It would be possible to do a quick ‘sketch’ user journey here too by adding sequential numbers to the ‘notes’ one puts in the boxes. 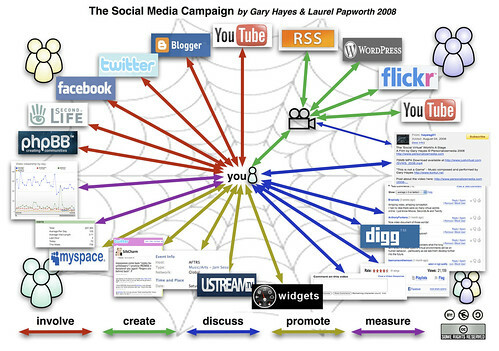 This was a diagram I threw together at Bangkok airport believe it or not early in 2007Â – simply looking at the influence that people have in the sharing web. It is intended to show a whole bunch of ‘indicative’ ideas about the proportional numbers who contribute to web 2.0 through to the influence each category of users have on it – I also invented in my jet-lagged haze five categories, The Creators, The Editors, The Critics, The Sharers and The Consumers. This was discussed here on this blog and heavily dugg too last year. A relatively recent diagram when I was trying to get my head across ‘shared worlds’. I often get asked about shared worlds being just game worlds (WoW or Second Life) but of course it extends across a whole genre of services online. I didn’t include the shared worlds of email/forums/twitter etc etc but concentrate on worlds specifically aimed at stories or games for this particular chart. The ubiquitous x and y axes here are about x – physical to digital 3D and y – Functional to Game. 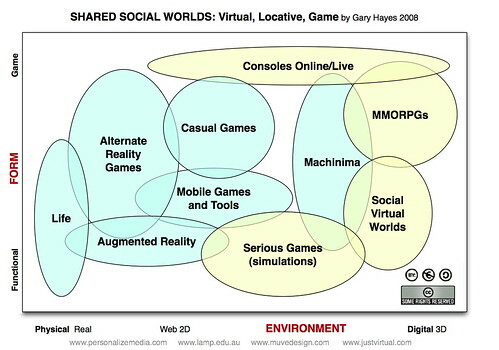 It is therefore easy to map ‘real life’ at bottom left as physical/functional while top right digital and game as being the traditional MMORPG. Finally couldn’t post diagrams without a very recent one I did with the wondrous and exquisite Laurel Papworth which merges the above thinking with how to promote and reach out across the vast landscape of social media. Here is a description from the flickr photo that has already had 1600 views or so. * MEASURE – monitor, iteratively develop and respond or be damned! As I said there are many more on my flickr account and will be adding another 30 or so old archive ones in the next months.